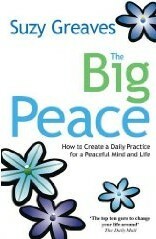 “I started the Big Peace blog in 2007 because I was sick of setting goals to get me more/better/more. I wanted to get off the treadmill and appreciate what I had, I wanted to ‘find’ some sense of inner peace. Well, what a journey it’s been. I thought the road to peace would be all about angels singing harmoniously in the background as I meditated on my navel. No such luck! It’s been a journey inwards that has made me question the very cornerstones of my life. It’s required me to be very brave – to face my demons, to live more, to love more. In the past two and half years, I’ve learnt how the brain works and how to train it for inner peace, have interviewed some of the world’s greatest gurus, have left my husband after being married for 16 years and got a dog. As I say, my journey to ‘find’ my missing peace has been an eventful one. And finally I got ‘there’, to find I hadn’t lost it in the first place. I just had to tap my heels together and I was ‘home’. I’ve finally realised The Big Peace is not a destination but a choice every second of every day. It’s actually a very simple (if not always easy) daily practice. Suzy Greaves has been named as ‘the top ten guru to turn your life around’ by the Daily Mail and is one of the UK ’s leading life coaches. She is also a columnist for Health and Fitness magazine, founder and managing director of The Big Leap Company. She also writes regularly for the national press – Sunday Times Style, Red magazine, You. She lives in Surrey with her son, Charlie and Oscar the dog. The Big Peace in just 23 minutes a Day. admin on Spring into Spring: Day 1. Bronwyn on Spring into Spring: Day 1. Tracey Rissik on What to do with your next rejection letter…. How to stay married without losing your sanity. Daily and weekly deadlines at The Big Writer's Club. Start writing today.